To treat a cavity the dentist will numb the area of the tooth to ensure there is no discomfort during treatment. Then the dentist will remove the decay from the tooth and fill the area with a tooth colored filling material that is both natural looking and extremely strong. 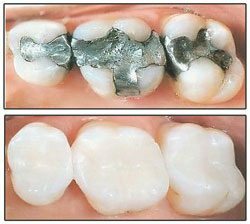 In the old days dentists used silver colored fillings, know as amalgam. Amalgam is a mixture of mercury, silver, tin, zinc, and copper. Most dentists no longer use amalgam because it contains mercury, discolors the surrounding teeth, is sensitive to temperature and some people are allergic to it.